At 09:15, arrival Otopeni airport. Private transfer airport / hotel. Stop to visit The Village Museum, outdoor museum, one of the main tourist attraction in Bucharest, showing a unique collection in Eastern Europe of old villages, peasant houses from all the regions in Romania, old furniture and tools. Panoramic sightseeing Bucharest including view of the most important buildings and squares: The Patriarchy Hill, a sacred site with historical significance, Unirii and Universitatii Square, The Palace Square, visit of the iconic The Romanian Athenaeum (Bucharest's most prestigious concert hall and home of George Enescu Philharmonic), the former Royal Palace, City Hall and Cismigiu Garden, Opera house, Cotroceni quarter, The Arch of Triumph (the same architecture of Arc de Triomphe in Paris), The Romanian Athenaeum (Bucharest's most prestigious concert hall and home of George Enescu Philharmonic). Squares: The Free Press House, Charles de Gaulle, Victoriei, Romana, Revolution, Universitatii and Unirii. In the afternoon, transfer to the hotel. Free afternoon for relaxing. If clients are after long flight journey, we suggest dinner with European food at the hotel. Breakfast. Around 09:30-10:00 departure in sightseeing tour of Bucharest. Visit of the Parliament`s House, the world’s second-largest building in surface area (after the US Pentagon) and the third largest in volume. Visit of the National Museum Cotroceni Palace, the official residence of the Romanian President, built on the site of a former monastery. A pleasant walking and visit of the old historical center and The Old Princely Court, including Lipscani District, with old buildings, pedestrian streets full of restaurants, bars, clubs, shops with antique or artistically handmade souvenirs products; Curtea Veche Church, the oldest church in Bucharest, located in Old Historical Center, preserves its original shape and grounds. Manuc's Inn (Hanul lui Manuc) in Old Historical Center is the oldest inn in Bucharest. Transfer to the hotel for a short rest. In the evening transfer from the hotel for traditional Romanian dinner in “Caru cu Bere” Restaurant in Old Historical Center - the oldest beerhouse in Bucharest, a traditional place and impressive architectural building, where you can taste culinary recipes or drink homemade beer. Every evening there is show with folk Romanian dance & music and other surprises! Breakfast. In the morning departure to Constanta on the highway for a 2,30h journey. On the way, stop at Murfatlar Winery for Lunch with Romanian dishes+Wine tasting and visit of the Vineyard and Wine Museum, an impressive collection of wine presses, proof of Dobrogea`s noble wine-making tradition. 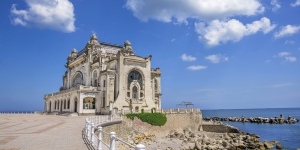 Trip continues to Constanta, Romania's largest sea port at the Black Sea with a history some 2500 years back, founded by Greek colonists from Miletos in the 6th century BC and known as Tomis, then was conquered by the Romans in 71 BC and renamed Constantiana. In the afternoon, panoramic sightseeing tour including the most important landmarks: Ovidiu's Square, The Roman Mosaics, The Great Mahmudiye Mosque (1910), St. Peter & Paul Orthodox Cathedral (1885), The Casino (1910), The Genovese Lighthouse (1860). Transfer to the hotel. Overnight in Constanta. Breakfast. In the morning departure to Bulgaria along the The Black Sea shore passing Mangalia, Romanian`s second most important harbor mainly for military purposes and ship repairing, an Ancient Greek small town known as Callatis for its several minor archaeological sites and health centers. At 70km. distance from the border, stop in Balcik, a small resort on the Bulgarian Black Sea coast and a historical one with many culture influences: Thracian, ancient Greeks, Byzantine, Ottoman, Turkish and Romanian; small houses, Orthodox Church, harbor. Visit of the Balchik Palace, the favorite summer residence of Queen Marie of Romania, built between 1926-1937 during the Romania`s administration of the region. The impressive palace has Balkan and Oriental architectural motives and consists of residential villas, wine cellar, monastery, chapel, holy spring and a huge botanical garden on 65.000m2. After lunch, departure to Varna, the third city and maritime capital of Bulgaria, the most interesting and cosmopolitan town on the Black Sea coast. Walking tour including the most important highlights: The Archaeological museum, where in three especially dedicated exhibition halls is presented the oldest processed gold in the world –4600-4200 BC, The Cathedral – one of the symbols of Varna, a perfectly preserved example of Orthodox architecture, The Roman Baths – the forth largest known Roman baths in Europe and the largest antic public building in Bulgaria. Breakfast. Free morning for walking, sunbath, shopping. Around 11:00 departure to Romania. Crossing the town from south to north to the airport, you`ll see the Martyr-Heroes of the December 1989 Revolution Cemetery, where many of the 1000 victims of the 1989 revolution are buried. If time permits, before arriving at the airport, walking in Herastrau Park – the largest park in Bucharest or stop to shopping center. Transfer to the airport. End of the trip. Not included: Entrance fees, meals (except breakfast), optional trip, Festive dinner Caru cu Bere.